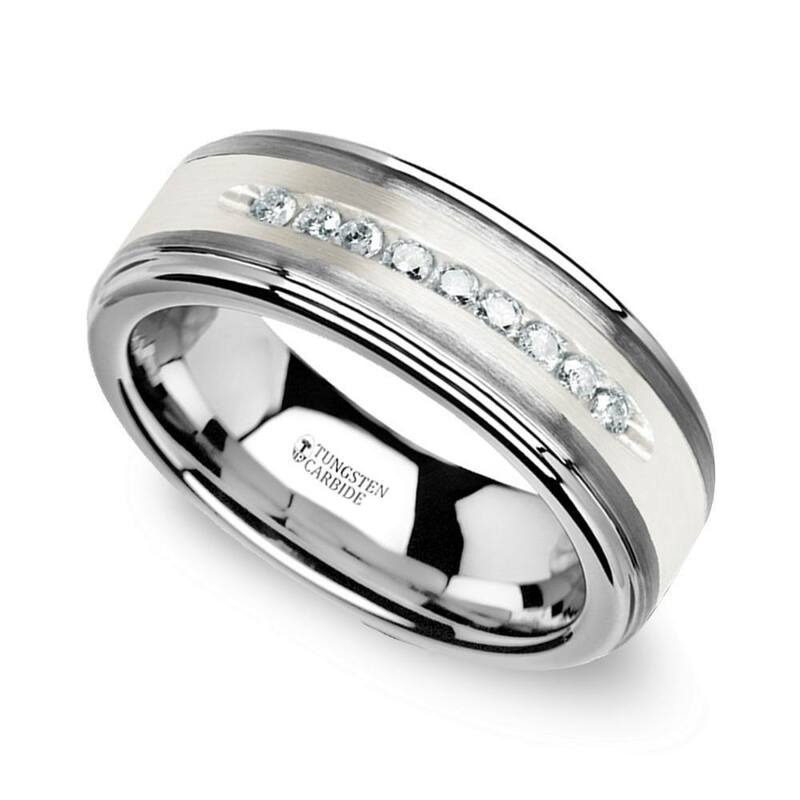 Some brides or grooms want a traditional wedding band…just with a little more spark. A channel set diamond wedding ring takes a simple wedding band to an entirely new level of style and sophistication. While the ring maintains a traditional and conservative style, the beauty and luxurious appeal of diamonds create fire and elegance. Every channel diamond wedding ring displays a line of seamless spark, and the term “channel set” is derived from the manner in which the diamonds are placed within the band. 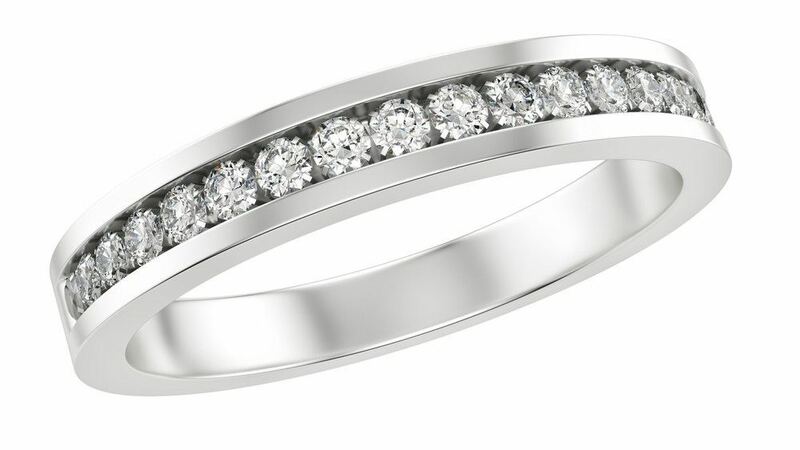 Channel settings are prongless; instead, the diamonds are held in place by the tension of the top and bottom of the metal setting…and this creates a metal channel. The result is a beautiful setting that is often associated with the Art Deco era due to its clean and symmetrical lines. Diamonds are more protected in channel settings than they are when secured by prongs. Since the diamonds are placed deep within the band, it’s also incredibly difficult for them to snag or get stuck on clothing. For this reason, a channel setting is the perfect choice for men and women who work with their hands or constantly worry about losing one of their valuable diamonds. This type of wedding ring is perfectly suitable for everyday wear, so you’ll never have to take it off of your finger after exchanging vows. Diamonds used in a channel diamond wedding ring must be uniform in size and shape. The allure of this setting is the seamless structure, so consistency in size, color and shape is pertinent. However, all diamond shapes may be used in a channel setting and each shape creates a different beauty and style. Round brilliant diamonds offer the most brilliance and are a traditional choice. 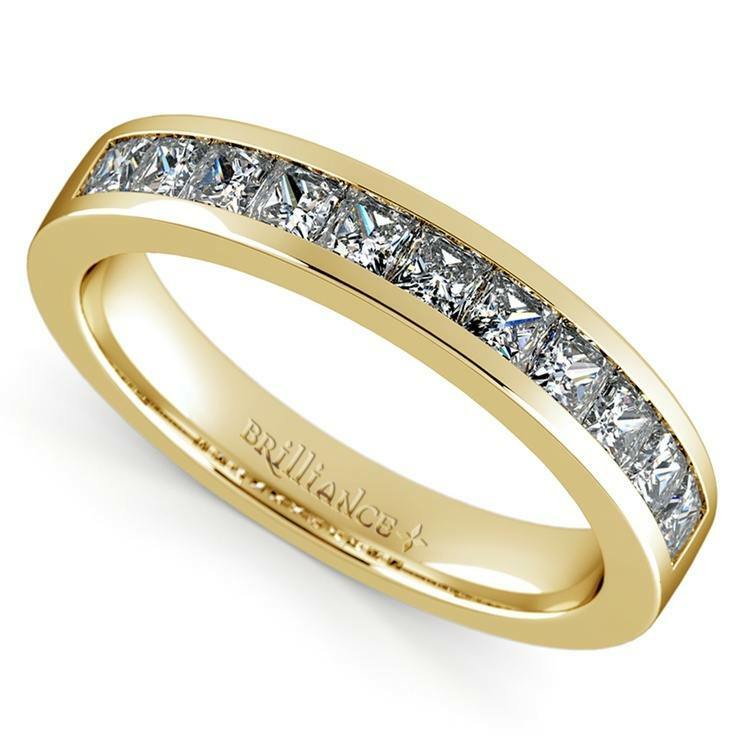 Lining up round brilliant diamonds in a channel setting will ensure the ring sparkles and shines from across the room. Square or rectangular shaped stones like princess, Asscher, emerald or baguette nudge together for the ultimate in seamless sparkle. These shapes are more modern, but still sophisticated and traditional. In fact, princess cut diamonds are one of the most popular choices for channel diamond wedding rings. As diamonds will be placed side by side, color should remain consistent for each stone. A yellow-hued stone will look very obvious when set next to a colorless counterpart. Be sure that the diamonds in your channel diamond wedding ring all exhibit similar color grades for this reason. Clarity, however, isn’t such an important consideration. As diamonds used in most channel diamond rings will be smaller carat sizes, the clarity is not nearly as obvious. The setting will also hide minor imperfections located at the top or bottom of each diamond. When designing a channel diamond wedding ring with larger carat diamonds, choosing the right clarity and color becomes more important. Flaws are more visible in larger stones, so channel set rings with larger diamonds should have a higher clarity grade. Most experts would recommend that choosing diamonds with a clarity grade of Slightly Included (SI) or higher. Although most channel diamond wedding rings feature round or square shaped diamonds, fancy cuts like marquise or pear also may be used. These shapes can create a unique channel design within a ring. While marquise diamonds can be placed in a channel setting, work with a jeweler on the design structure. Setting marquise stones tip to tip may result in damage. Colored diamonds or gemstones also may be integrated in channel diamond wedding rings, and you can alternate hued gemstones and diamonds to create a patterned design element within the band. 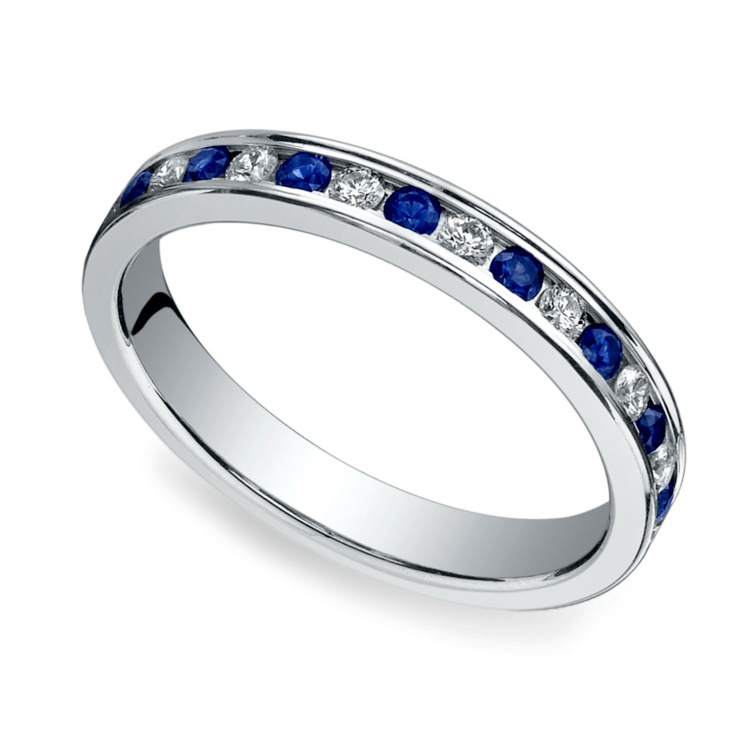 Choose your birthstone or the gemstone that represents the month of your wedding. Patterns also may be created in channel set rings using gemstones and diamonds (like red, white and blue for a military wedding). You can also use gemstones to show off your favorite team’s colors. It’s your wedding ring, so feel free to personalize it with bright-colored gemstones in any way you see fit. This versatile setting works well with all types of precious metals, including platinum, white gold, yellow gold, rose gold, and palladium. Because there are so many options, it’s easy to find a ring with a channel setting that is within your budget. It’s not hard to see why so many men and women love wearing channel set wedding rings to symbolize their love and commitment to one another. If you plan on purchasing this style, it’s important to select a ring in the right size. It’s difficult to resize rings with channel settings, so it’s best to buy the right size instead of going through the trouble of resizing it. 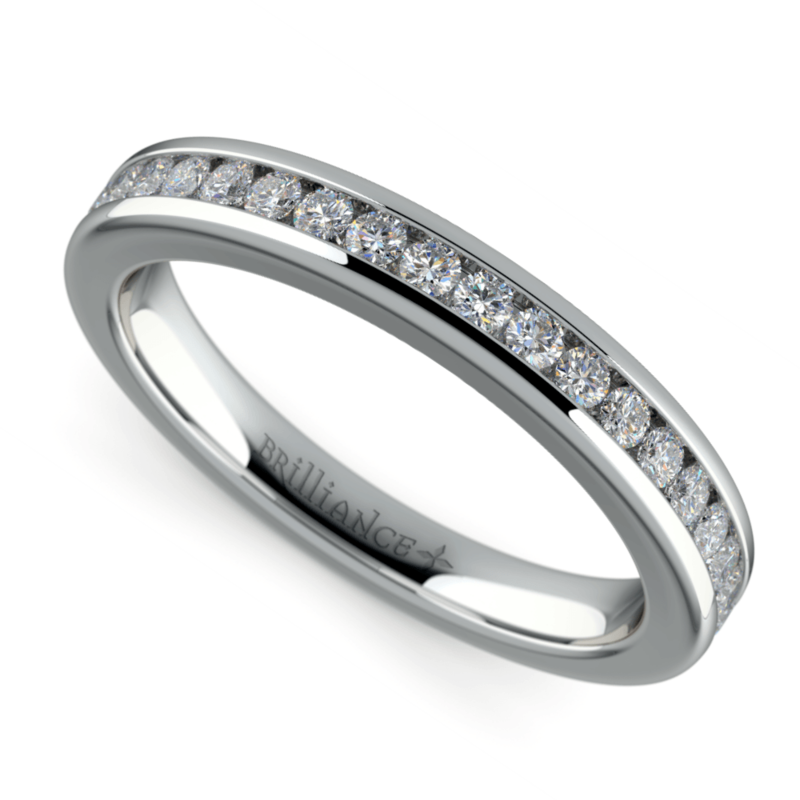 A channel diamond wedding ring offers numerous design options that give a traditional wedding band a stylish upgrade. Choose smaller diamonds or bigger carat weights for an amazing seamless sparkle…just be sure that all diamonds within the setting are the same shape and color. Of course, you also can integrate gemstones into the channel design by alternating diamonds and gemstones for a stylish pattern of color. No matter how you design your ring, channel set diamonds infuse your setting with seamless sparkle and brilliance!